Wayne Hirst capped a fine first season in charge of Wakefield Trinity Ladies as he was named the 2018 Women’s Championship Coach of the Year. The Wakefield boss was named as the winner of the award prior to last Saturday’s Grand Final between Wigan Warriors and Warrington Wolves. Trinity won the League Leaders’ Shield before missing out on the Grand Final after a narrow defeat in the play-off semi-final against Leigh Miners Rangers. “I knew I had been nominated but for me to get something like that is amazing,” said Hirst. “I went into coaching the ladies’ team with a bit of an open mind and looking at it as a bit of a building season. “I have not coached open-age ladies before but having the success that we have had and being awarded coach of the year is fantastic. “I went up against all the other coaches from the Championship and Championship One. “It is something that I didn’t expect at all - I couldn’t have asked for anymore. 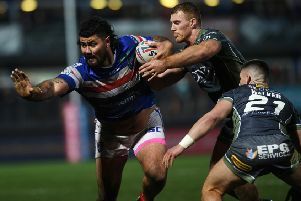 Hirst feels that the positivity surrounding his Wakefield side has put them in a good position heading into 2019. It is likely that Trinity will compete in the Women’s Super League next season as they look to improve on and off the field. Hirst added: “It has put me as coach and us as a team in a very good light for next year.